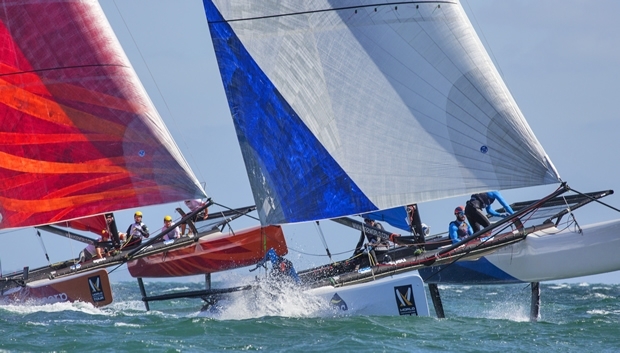 The second day of the World Match Racing Tour Fremantle served up some high-octane excitement, as the 20 international teams did battle with each other and the Australian elements today. Today was the second day of fleet race qualifying, and the famous Fremantle Doctor was blowing harder than day one, gusting up to 25 knots with a few nasty waves making Bather’s Bay a tough, unyielding race course. For the fleet racing, the 20 teams are divided into four groups of five. Last on from the previous day were first on this morning, to give each of the groups the best chance of a varied set of conditions. Like clockwork, the breeze builds throughout the day, so now it was a chance for Group D to experience the lighter end of the wind spectrum. Sweden’s Nicklas Dackhammar put the hammer down to win three heats and take second in the next, making him the clear winner of his group. Western Australian Keith Swinton had his back against the wall after a poor start to his regatta on Wednesday. The top three in each group are guaranteed a way through to the knockout stages when the match racing begins, while the bottom two have to fight it out for a place in the play-offs tomorrow. So it was important Swinton upped his game in front of his home crowd in Fremantle. And he did. “We had a bit of a shocker yesterday, a few unforced errors, but we talked it through last night and managed to execute the basics much better today,” said Swinton, whose scores of 2,4,2,1 lifted him to 2nd place in the group. Phil Robertson sailed a solid day, aided by his new team that includes America’s Cup veterans like Pierluigi de Felice and Xabi Fernandez, and won Group C ahead of Olympic silver medallist Hans Wallén from Sweden and the Spindrift crew from France skippered by Yann Guichard. Already the boat-to-boat combat has begun even before the match racing, with a tight situation at the leeward gate resulting in Denmark’s Joachim Aschenbrenner capsizing while trying to avoid a collision with Chris Steele from New Zealand. No one was injured and the boat was upright again in just five minutes, with no damage to equipment, only some slightly bruised egos. Reigning World Champion Ian Williams enjoyed a perfect start to his regatta on day one, but the GAC Pindar skipper and the rest of Group A have to wait until tomorrow to complete their qualifying after final session of racing was cancelled due to the ever-increasing breeze. Friday’s schedule starts with some Pro-Am Racing in the morning, then it’s Group A’s turn to finish their racing, followed by the Play-Offs to determine which of the bottom eight teams can secure one of the four remaining spots in the match racing, and which four teams go home for an early bath.